Holmegaard Cocoon Bourgogne red wine Glasses by Peter Svarrer. 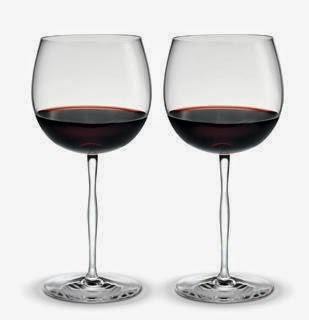 The shape of your red wine glass is very important to the way the wine will taste. This glass is designed to add a sensuous experience when you touch the stem of the wine glass. The glass reflects light in the most perfect way. That is why Cocoon was created with its organic and curved shapes”. With the glass designed to let flavours and aromas of the wine come into play and make the wine its own. The simple design means that the glass can be combined with many different kinds of tableware. The line on the glass helps you to pour the correct amount of wine up to the widest point of the glass to optimize the nuances of the wine's flavours and aromas. The wine glasses come packed in a gift box with two glasses. A great gift idea! not least for achieving the perfect wine experience.